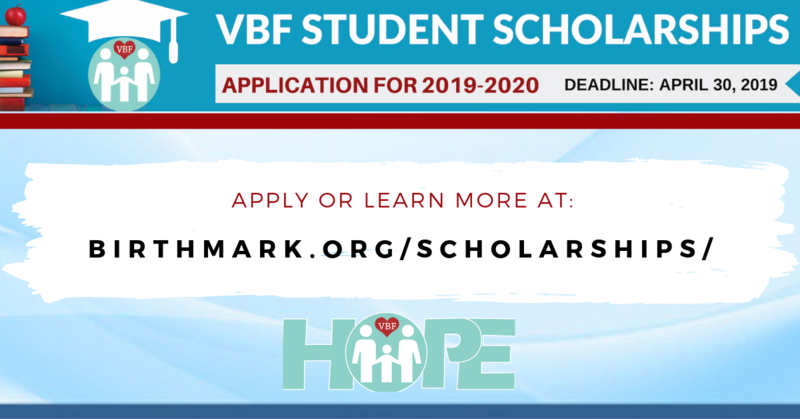 The Vascular Birthmarks Foundation is excited to launch the CALL FOR APPLICATIONS for our 2019 Scholarship Program. Dr. Roy G. Geronemus Humanitarian Scholarship Awarded to students who, like Dr. Geronemus, have exhibited qualities such as caring, compassion, generosity and who have donated time and service to help others in need. Frank Catalanotto Perseverance Scholarship Awarded to students in any field of study who have demonstrated through their living with a vascular birthmark that they have both the “heart and the hustle” qualities of life. Dr. Martin C. Mihm Health Career Scholarship Awarded to students who plan to complete an undergraduate degree in the field of public health, health promotion, or disability studies (including policy and research), or a related field of disability and health. There are no minimum GPA requirements for any of the scholarships. Transcripts, letters of recommendation from a teacher and an academic advisor, a photograph and description of the student’s birthmark, tumor or related syndrome, and a personal 800-word statement from the student applicant are required. Applications for the 2019-2020 academic year must be completed no later than April 30th. Applications may be completed online here; supplemental transcripts and/or Letters of Reference are due to VBF (info@birthmark.org) by the deadline. The VBF Board of Directors will evaluate the applications received and determine awarded recipients. Award notifications will be made in June. Scholarships will be paid directly to the recipient. Members of the VBF community are encouraged to share this Call for Applications with students, high school counselors, college bulletin boards, and the offices of physicians who provide care to those with birthmarks.